Girls classes are for girls aged 6 years and older. These classes are an hour and fifteen minutes in duration. Girls workout on all the women’s competitive events including vault, uneven bars, balance beam, floor exercise, trampoline and tumble track. Girls recreational classes are designed for girls beginning at age 6. Physical fitness, strength, flexibility, coordination, self confidence building, kinesthetic awareness and goal setting/aquisition. 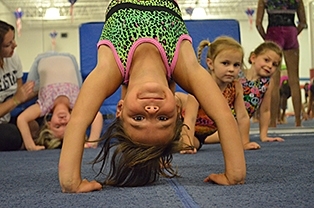 These are the fundamentals of our gymnastics program. Here at OSSG we pride ourselves on the fact that we don't just teach kids to flip. Our main focus is to develope better kids using gymnastics as the vehicle. We know you'll be pleased with the transformation in your child just after a few eight week sessions. The owner has a degree in elementary education with a minor in child psycology combined with years of gymnastics training and teaching from preschool up through the advanced levels. OSSG is the oldest and most prefessional program available in the State of Rhode Island. Founded 1/1/1980. Call today 401-333-1530. Studies have found that gymnastics develops the vestibular mechanism which literally grows the brain! As a result, coordination and control of the body improve. The earlier children begin gymnastics the better their development will be. This not only means children involved in gymnastics will be great gymnasts, or athletes in general, there are academic benefits as well. Here at Ocean State Gymnastics Center we have a talented, highly trained staff who work with children from the age of 1 year and up. You’ll be amazed at our “state-of-the-art” facility! You can’t get better training anywhere! Call to reserve your spot now at 401-333-1530. We’re not just creating great gymnasts, we’re developing better kids™.